Build a lean-to, windbreak or snow cave for protection from the wind. Place rocks around the ﬁ re to absorb and reflect heat. Melt snow for drinking water: • Eating snow will lower your body temperature. You will become quickly disoriented in wind-driven snow and cold. Tie a colored cloth, preferably red, to your antenna or door. From time to time, move arms, legs, fingers and toes vigorously to keep blood circulating and to keep warm. When using alternate heat from a ﬁ replace, wood stove, space heater, etc., use fire safeguards and properly ventilate. Eat and drink. Food provides the body with energy for producing its own heat. Keep the body replenished with ﬂuids to prevent dehydration. Wear layers of loose-ﬁtting, lightweight, warm clothing. Remove layers to avoid overheating, perspiration and subsequent chill. The above is an excerpt from the article, “Winter Storms: Deceptive Killers.” For more information, please visit www.nws.noaa.gov. 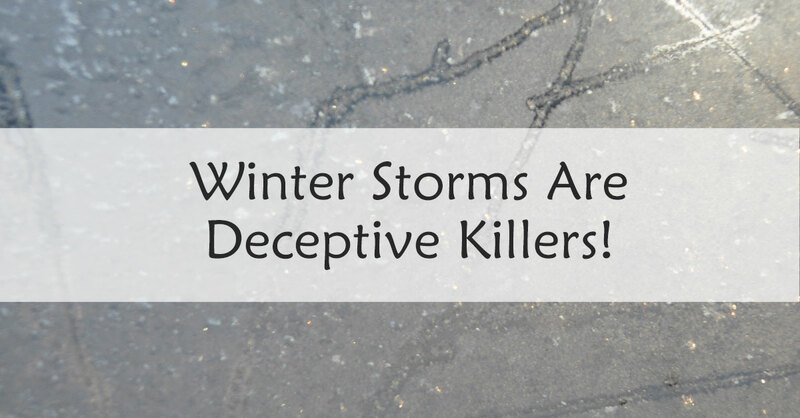 Be Prepared: Winter Storms Are Deceptive Killers! At home and work primary concerns are loss of heat, power and telephone service and a shortage of supplies if storm conditions continue for more than a day. Extra food and water. Have high energy food, such as dried fruit, nuts and granola bars, and food requiring no cooking or refrigeration. Heating fuel. Refuel before you are empty. Fuel carriers may not reach you for days after a winter storm. Emergency heat source: fireplace, wood stove, space heater. Use properly to prevent a fire. Test smoke alarms once a month to ensure they work properly. Make sure pets have plenty of food, water and shelter. Compass and road maps. Keep your gas tank near full to avoid ice in the tank and fuel lines. Avoid traveling alone. Let someone know your timetable and primary and alternate routes.